In textbooks and hospitals, pain is usually described in terms of bodily experience: throbbing, burning, sharp or dull, spreading or situated. 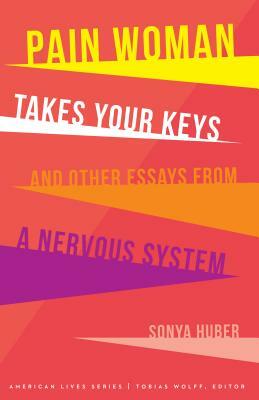 But in Sonya Huber's hybrid essay and poem collection, Pain Woman Takes Your Keys and Other Essays from a Nervous System, she explores the complex layers and textures of experiencing bodily pain and living with a physical disability: the experience of being a partner with pain in daily life, as if pain is its own separate being, both parallel and tangled with your own. As a person living with autoimmune disease and disability, I found new ways to name the relationship I have with pain through this book, the way I reject and befriend the pain, argue with it, own it, and how my relationship with it shifts and grows. But I don't think one needs to experience autoimmune disease to understand this. This experience can be familiar to anyone living in a female (both the imagined or felt) body, the queer body, the mother body. It is impossible to have pain and chronic illness in a female or non-binary body without having to confront the age-old stereotypes of hysteria and fragility within the medical community. over and over what it was. sometimes forgets what it was angry about. Huber's background is in journalism and social advocacy and she currently teaches in the English Department and the Low-Residency MFA program at Fairfield University in Connecticut. She's a former Literary Mama contributor, and her previously published books, all nonfiction, range from an examination of Hillary Clinton's evolution as a politician to a memoir on working minimum wage jobs without insurance. Pain Woman Takes Your Keys focuses on the pain caused by autoimmune diseases, including rheumatoid arthritis, from which Huber experiences fatigue, severe joint pain, and difficulty with mobility. In "The Lava Lamp of Pain," one of the first essays in the book, Huber describes being "wacked out with pain" and existing in an altered state of being, where "everyday objects seemed to shine." This essay serves as an introduction into how she began experiencing the pain and disability caused by multiple autoimmune diseases. She recalls her early thirties suddenly feeling like "I was left with a glowing skeleton," or a "silverware mess in a drawer." She finds out her body is in an almost constant state of "self sabotage," creating debilitating inflammation that comes and goes. Lying in bed at night, I felt my skeleton pulsing … I didn’t know then that I had become a lava lamp of curling, invisible storm clouds, filled with a surge of mute motion that might be its own fierce beauty … I was devouring myself. Huber does not allow herself to use easy categories or definitions of grief, acceptance, or sorrow about living with disease and she rejects the notion that she should be grateful for her illness and her debilitating pain. (She dedicates an entire essay, in fact, to exploring the "blunt language of gratitude" and the lack of precision inherent in language used to describe life with chronic pain.) Instead, in the expansive, probing essays in the first section, "Pain Bows in Greeting," Huber examines her relationship with pain and the experience as a kind of "landscape." Like a complicated friend, pain is both insistent for attention and cruel, "stubbing out the cigarette of your to-do list." But it also requires her to stay still, is "wild with grief for the discomfort it causes" and "does not want to harm you." In the second section, "Side Projects and Secret Identities," Huber describes what living with disease and chronic pain can force one to reject—productivity culture, and limit-pushing, bodily or otherwise. To be "in a scandalous state of illness," she writes, means learning to be a being without utility. Yet, she insists that this experience is not singular, but universal, because "my body is still within the range of human experience." She seeks understanding, wanting to get past others' visceral reactions of discomfort when friends and coworkers see her walking with a cane or physically struggling. For instance, she notes the way some friends or coworkers physically freeze up upon seeing her with a cane, either uncomfortable or wanting to seek an immediate solution. To them, she says, she is a symbol of death approaching, of the unsolvable: "I watched as their eyes squinted in fear. The reptilian part of their brains hissed, and said: Danger. Back away." Huber also explores how she documents her pain to understand it, and how she writes differently when she is drowning in bottomless pain. Being around people can be an announcement, she writes, that "here is a woman who has been mowed down." But Pain Woman herself has a message, an urgent voice, and demands attention that Huber's non-pain voice seeks more tentatively. Pain Woman gives no shits. Pain Woman has stuff to tell you, and has one minute in which to do so before she's too tired. Pain Woman knows things … My non-pain voice searches for metaphors to entertain you. She aims to fascinate with far-reaching, pretty, solar system curlicues, hiding behind constructions that allow you to forget for a second that you are looking at a woman at all. Pain Woman takes your keys and drives away. The beauty, however, is the way she has learned to connect with others as a person in pain and with physical differences—and not always with other people who also have similar experiences. She shares openly about her pain on social media and among her friends, and find support through friendships with other women living with chronic illness. Friends and strangers send her stickers of with feminist icon (and chronic illness sufferer) Frida Kahlo, slogans, and unicorns to affix to her cane after Huber shares on social media how she is struggling to accept her cane. Ultimately, Huber says that being a person with pain, as a daily experience involves an "inextricable intimacy that does feel a lot like love." As a writer with similar daily experiences of living with debilitating pain caused by autoimmune disease, I am grateful for Huber's glittering imagination and intelligence in these essays. She asks readers to include us as part of the human narrative, and we are, by virtue of her refusal to look away. The majority of chronic pain patients are women, and the medical establishment seems to have a hard time hearing or treating them … Health-care costs in the United States continue to escalate, and a chief driver to those ER visits and expensive diagnostic procedures is chronic pain. And, she adds, "people with chronic pain do go to the ER out of desperation," because of how their symptoms of pain are often ignored or untreated by their regular physicians. The greatest strength in Huber's collection, however, is the way in which she allows you to witness her struggle; I was emotionally floored and touched most deeply by Huber's lyric essays in which she reveals vulnerability and desperation. Her poetry and lyrical prose flutters from thought to thought, seeking for something to call this way of living, somewhere to contain it in an expression. Anyone can understand this form of seeking, and in sharing her story, Huber allows us—those living with illness and disability, women, girls, mothers—to be brought into the fold of the current human narrative. You are not alone, she tells her audience. For that, I am deeply thankful. Leslie Contreras Schwartz’s essays and poetry have recently appeared in Catapult, The Collagist, Tinderbox and Rogue Agent. Her second book of poems is forthcoming from Saint Julian Press in 2018. An excerpt from her novel-in-progress will be included in the Houston Noir anthology, edited by Gwendolyn Zepeda (Akashic Press, 2019).